The Inglewood Apartment is an attractive recently refurbished one bedroom self catering, serviced apartment with its own private garden. Modernised to a high standard in contemporary themes, the apartment's location and setting make it ideal for both business and pleasure. The apartment is based in the historic town of Alloa right in the heart of Scotland and halfway between the major cities of Glasgow and Edinburgh. It’s location in the centre of Scotland next to the area’s expansive motorway network makes it an ideal base to explore Scotland. Alloa is just 8 miles from Scotland's ancient capital Stirling, home to the towering Stirling Castle and the impressive Wallace Monument. 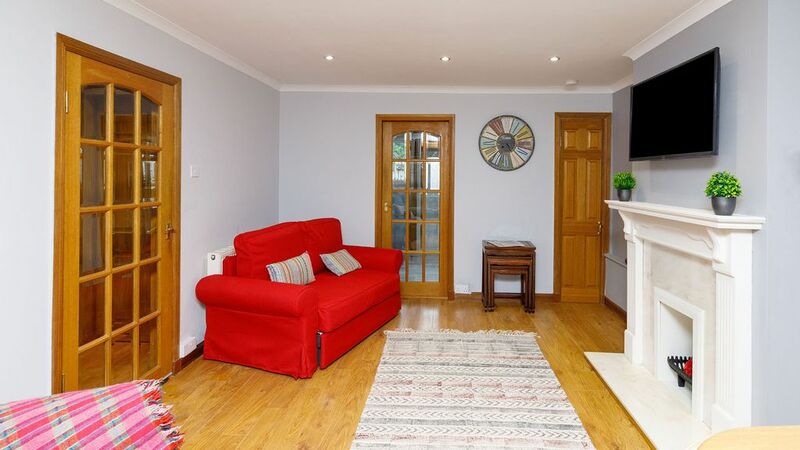 The apartment is 10 minutes from national motorway links and a short walk from the local railway station with frequent services to Edinburgh and Glasgow. Entrance through the front door leads into a hallway with the lounge immediately on the right and the fully tiled bathroom with shower on the left. The double bedroom is directly in front of you as you enter the apartment. The fully equipped kitchen can be found off the lounge. Very clean and tidy, would recommend this apartment to anyone. As we went to a funeral it was not a very nice stay, however Alloa was not a place I would go back to.